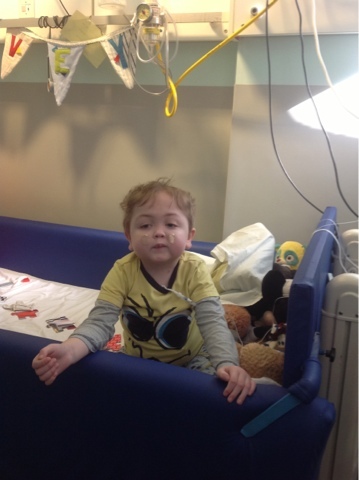 Harvey's Journey : Iron transfusion . . The iron transfusion happened this morning. It wasn't safe to do yesterday because it didn't arrive up to the ward until 5 and at that time there wasn't enough staff around incase anything went wrong. The transfusion lasted an hour and the first half an hour I had a nurse in with me and doctors we aware and on the ward for precaution. When it first started going through I went really red and had bad coughing fits but other than that things went well and my obs remained stable. The doctor said its a one off treatment and may possibly have to be repeated in 6 months time, hopefully though the results will last longer than what the blood transfusions did. Saw the usual Gastro doctor this morning, no changes are being made to my care plan, just to continue. It was also the TPN ward round today, a few changes are going to be made in my nutrition because my weight is going up too much now. It's not as simple as just reducing calories though because last time we did this my blood sugars got effected and in TPN it's not just fat it's glucose too. If they reduce fat but not glucose I'll still gain weight and if they cut glucose and fat my sugars will be effected again so they need to find the right balance. In myself today I feel ok, I'm getting bits of pain but that's not stopping me from being cheeky and making mummy laugh!! Clair's back on today so I've raided her pockets and nicked her badge! Salena came to see me for 10 mins (hide in my room) earlier and play with my puzzle pieces. I have so many lovely ladies that fight over me and come spend time with me. I've got a quiet hour so thought I'd update all you lovely people. I had a visit from Ann and Heather earlier, that was a lovely surprise. Heather was in hospital a few months ago very poorly but she is looking really well now. It's the fundraiser on Saturday at the golf club, body shop party, disco and raffle. It's lovely how people are wanting to help me so much and are organising all these events for me. There's a few other events that have been talked about too. Thank you, it means a lot to myself and my mummy and we are very touched by all the support. hi how do u get hold of the raffle tickets please. i want to buy 5 can i meet somewhere to pay for them.is holly tracys daughter who lives on park rd new mills what ever am going wilmslow today but could call at tracys mon after work if leave them there.what ever easy.